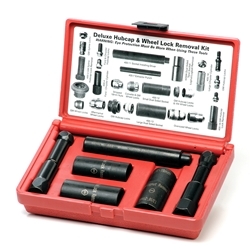 Wheel Lock Removal Kit 31 inc 14-830 / BOWES TT 37830. The Deluxe Hubcap and Wheel Lock Removal Kit safely removes and replaces GM, Ford, and Chrysler wire wheel hubcap locks on 1978 or newer vehicles. Also removes factory and most aftermarket locking lug nuts. Includes instructions and is packaged in a custom carrying case.